As a real estate agent, you work with purchasers who have varying amounts of experience in buying homes and acquiring mortgages. For the first-time buyer, more support is going to be necessary for the way of explaining the different types of mortgages and the process of applying to a lender and financing a home. You may also be called upon to explain mortgage options to new real estate investors as well. This is a function of several factors: How much of a monthly payment can your client afford? Given the client's unique credit and employment history, income, debt situation, and financial goals, how much will a lender loan? A mortgage broker or loan officer can help you answer the first question and will present several different financing scenarios based on the answers to a few simple questions. Depending on standard lender guidelines, your client-borrowers should have a good idea of what terms and funding program they will benefit from the most. This is where the rubber meets the road and your client saves the most money. With the client’s permission, the broker or loan officer pulls a credit report. This credit report—along with the client’s residential and employment histories and income, debt, and assets—helps determine prequalification for financing. You, as the real estate agent or broker, use your client’s prequalification status to make the best offer on the real estate your client chooses. While you and your client focus on choosing a property, the broker or loan officer can work on finding the right loan for your client. Once your client makes an offer that the seller accepts, it is time to complete the loan application process. The value of the home is reviewed by the bank as part of the loan application. 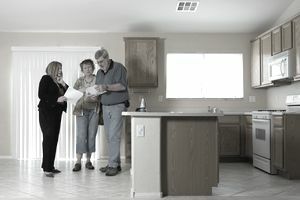 While appraisals were historically always ordered at this time, some areas are moving away from traditional appraisals in favor of an approach to valuation that's based more on big data and crowdsourcing than on recent sales of comparable properties. You work with the seller’s real estate agent to designate an escrow or title company to handle funding for the loan once it has been approved. The broker or loan officer works with the title company to make sure all documents required by the lender are received and are in order. Your client signs all the closing documents at the escrow or title company's offices. The mortgage loan process is a complex system and very rarely goes without glitches. While some lenders want you to believe the online loan application process is a snap, many borrowers end up overwhelmed and confused by it. These borrowers end up abandoning the online application process and calling someone who can help them. As a real estate agent, you can demystify the process and do most of the heavy lifting for the client-borrower. This frees up the client-borrower to concentrate on what is important: preparing to move into a new home, saving money, or making plans for their home equity check. Helping buyers is what buyer agency is all about, and mortgage information is a very important part of that.